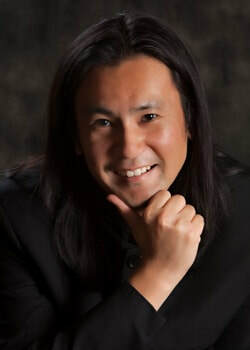 Thunder and Lighting Polka J. Strauss, Jr.
Toru Tagawa has served as the Artistic Director and Conductor of the Sierra Vista Symphony since 2016 and as the Music Director and Conductor of the Tucson Repertory Orchestra since 2011. In 2015, the Orchestra toured Japan, performing in Hiroshima and Okayama prefectures. He has been the Orchestra Director at Canyon del Oro High School since 2008. Under his direction, the Orchestra performed at Carnegie Hall on March 20, 2017. His conducting teachers include Thomas Cockrell, Charles Bontrager, Jung-Ho Pak, Maurice Peress and Sandra Dackow. Toru has participated in conducting workshops at the Juilliard School of Music and the Queens College, participated in Symposiums in Boston and Chicago and is a member of the Conductors Guild. He was one of the finalists in the American Prize 2014 as a Conductor in the Community Orchestra division. He is currently the president of the American String Teachers Association of Arizona. Toru, from Hiroshima, Japan, started playing the violin at age 6, and joined the Kurashiki Junior Philharmonic Orchestra at age 9. He received his Violin Performance degrees from the University of Tulsa (BM) and the Florida State University (MM), and a Music Education degree (MME) from the University of Arizona. His principal violin teachers include Steven Moeckel, Gary Kosloski, Eliot Chapo, Derry Deane, and Mikio Ejima. The award winning Mariachi Aztlán de Pueblo was founded in the Fall of 1992 as a curricular component within the Pueblo Magnet High School Performing Arts Department by Mr. Richard Carranza. Celebrating their 25th anniversary this year, they are comprised entirely of Pueblo Magnet High School students ranging in age from 14 to 18 years old. The mariachi program has grown from eleven students in its first year to well over one hundred and thirty students currently. Students are offered three levels of mariachi music: Beginning, Intermediate, and Advanced/Performing group – “Mariachi Aztlan”. Students entering the performing group must, after audition and acceptance, maintain a high level of academic achievement in order to remain on the “first team”. Their extensive practice and performance schedule also demands most of their free time. The seventeen-piece Mariachi Aztlan is motivated by pride and dedication to their cultural heritage of Mexico. The group plays authentic mariachi music, arranged and conducted by teacher and director, John Contreras, himself a mariachi musician with over thirty years of experience. Dressed in their elaborate traje de charro outfits, the group boasts a repertoire of traditional mariachi music. As Tucson’s most popular youth mariachi, they have gained a reputation for excellence, sharing the stage with many of the world’s finest Mariachi ensembles, Symphony Orchestras and world renowned artists like Pink Martini, Rufus Wainwright III, Calexico and Rita Moreno. Through their music, they are continuously promoting a manifest pride in their cultural background and are an excellent example of the best our youth has to offer.